Money is vital need today. No human being can live without money. Money is power, freedom perhaps everything for us. People are crazy about money & they are ready to do anything for money. Earning money is not enough, it is essential to do money management also. Today I am going to explain you money management with help of water. Sounds interesting right! Let’s look at money management inspired by water. 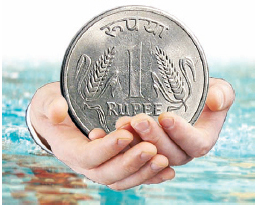 Money management share lot of resemblance with water. For survival water is essential similarly for living good life money is essential. Let’s look at some more similarities like this. You don’t like situation where you are getting limited water, similarly you won’t like limited money situation. Good intake of water is necessary to keep your body healthy, similarly good inflow of money will keep your financial life healthy. Drinking more money sometime may cause problem, similarly spending more money sometime creates a problem. Water of multiple streams makes big river. Similarly multiple source of income makes a large sum of money. You should look for second source of income to live wealthy life. If you drink unhealthy water from unfamiliar place you will face problems, similarly if you invest money at unfamiliar place you may face losses. Unhealthy water will make you ill, similarly unethical or black money can place you in odd situation. Offering drinking water to someone makes that person satisfied, similarly helping needy people by money makes you satisfied. Water kept block for long time lose its value, similarly money kept ideal for long time also lose its value (Inflation). You should never keep money ideal it is better to invest money. You can go through 10 Best Investment to get regular monthly income. Wasting water unnecessary is not good, similarly spending money unnecessary is not good. In scarcity of water you store water in tank or by other means, similarly you should make emergency fund to address emergency situation. You can enjoy taste of water by adding ingredients (E.g Lemon water). Similarly you should spend extra money on entertainment. In scarcity of water sometime we call water tanker. This is similar to taking loan when you don’t have money. To waste water of tanker in shortage situation is wrong. Similarly misusing or wasting loan money is also wrong. Remember water and money is scarce resource you should use it wisely for better life.